The 45-year-old rapper has long been a fan of the drug, and was a devoted supporter of reforming laws on the use of the substance in a recreational capacity. After California was revealed to have approved the legalisation, Snoop took to Twitter. "We just legalised marijuana in Cali. #smokeweedeveryday,” he said, adding a marijuana leaf and smoke plume emoji at the end of his tweet. 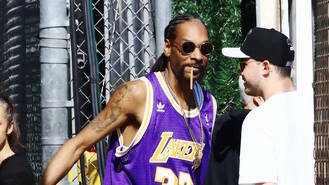 Snoop has also made his love of marijuana into a business prospect, executive producing new MTV series Mary + Jane, about two young women who run a weed delivery service. Speaking to Esquire magazine in September (16) about why marijuana is the perfect subject for a sitcom, Snoop explained: "With the world going crazy for marijuana and it's America's topic of conversation right now, as far as the legalisation of it all. The health issues and higher health insurance and the money - it's making and Denver, Colorado and other parts of the world where it's becoming legalised. It's becoming a big business now. It's good to show the intricacies of some dealers - female dealers - and giving the insight of the underworld before it becomes the over world." The decision to pass the so-called Prop 64, or the Adult Use of Marijuana Act, in California has paved the way for the U.S. state to become one of the leading marijuana markets in the world. Several other states in America also voted on whether recreational marijuana should be legalised, with Florida approving it earlier in the day. Following that news, actor and comedian Tommy Chong wrote: "Florida has passed legal marijuana! #Election #Florida," before adding a snap of himself sitting in front of several huge jars of the substance, writing, "Legal weed!! #ElectionNight." Massachusetts, Nevada, North Dakota and Arkansas also approved the act, and actor Seth Rogen revealed earlier in the day that he was supporting the legalisation, writing: "I'm (obviously) voting YES on Prop 64 in CA because I support legal, recreational marijuana!!!!!!!"